Chess Duels with the Champions. Type: BOOKS. Detail: Seirawan, Y. Product Code: 9781857445879. Hardback. Fourtime US Champion Yasser Seirawan provides a fascinating and highly entertaining account of his games and encounters with the world champions of chess including Garry Kasparov, Anatoly Karpov, Bobby Fischer, Boris Spassky, Tigran Petrosian, Mikhail Tal, Vassily Smyslov, Mikhail Botvinnik and Max Euwe. Having been involved in frequent battles against world champions over a 25year period, Seirawan is in an ideal position to reveal how it really feels to be facing the legends of the game. He describes and analyzes, in depth, his most memorable encounters both famous victories and painful defeats, against the best chess players of the last 50 years. During this time Seirawan has also been highly active in offtheboard chess activities. This has brought him into close personal contact with many of these champions. 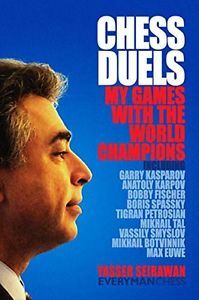 In "Chess Duels: My Games with the World Champions", Seirawan recounts many stories involving these giants of the game giving an intriguing insight into their personalities away from the board.